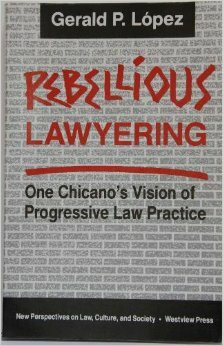 Gerald López, Introduction, Rebellious Lawyering: One Chicano’s Vision of Progressive Legal Practice (1992). Rarely has a critical text had such a deep and abiding impact on lawyering practice and theory as Gerald López’s Rebellious Lawyering. Lopez’s text (and a group of related works of legal scholarship written during an especially fertile period of critical thinking and writing on poverty law) has inspired generations of lawyers and shaped public interest legal practice since its publication almost 25 years ago. The imperative for lawyers to ally with those mobilizing in poor, immigrant, and communities of color against overpolicing and inequality is as strong today as it has ever been. To celebrate the 25th anniversary of Rebellious Lawyering, the Clinical Law Review invites the submission of abstracts describing potential full-length articles and essays, as well as shorter comments and dispatches, for inclusion in a symposium issue reflecting on the meaning of the text two-and-a-half decades after its publication. Authors are encouraged to reflect broadly and critically on rebellious lawyering in general, and the book in particular, to offer case studies, critiques, theoretical amendments, pedagogical insights, and other kinds of engagement with these ideas. What insights does rebellious lawyering offer us today? How have concepts of rebellious lawyering shaped our practices as lawyers and clinical educators? How do we describe an instance or series of instances of lawyering rebelliously? How have we failed to lawyer rebelliously in a given moment? How does lawyering and legal education today nurture and/or suppress rebellious practice? How can the ideas contained in the text be deepened, updated, reconstituted, extended? In style and substance, we hope for creativity and rebelliousness in the submissions. The symposium will be published in a special Spring, 2017 volume of the Clinical Law Review. Abstracts are due by October 30, 2015. The journal will expect to notify authors of symposium acceptances in November. On Sunday, May 1, 2016, the Clinical Law Review will host a half-day symposium during the AALS Conference on Clinical Legal Education, Clinics and Communities: Exploring Community Engagement Through Clinical Education, held in Baltimore, Maryland. Papers accepted for the special Spring, 2017 volume of the journal will be presented during two consecutive sessions during the symposium. Related programming at the conference includes an opening keynote address by Gerald López reflecting on the major themes of his book and a plenary session immediately following the keynote with clinicians who are interpreting and extending these themes and who will be reflecting on the lessons of Rebellious Lawyering for clinical legal education. The Clinical Law Review is a semi-annual peer-edited journal devoted to issues of lawyering theory and clinical legal education. The Review is jointly sponsored by the Association of American Law Schools (AALS), the Clinical Legal Education Association (CLEA), and New York University School of Law. The Review publishes articles, essays, and comments on lawyering, clinical teaching, legal practice, and related subjects.